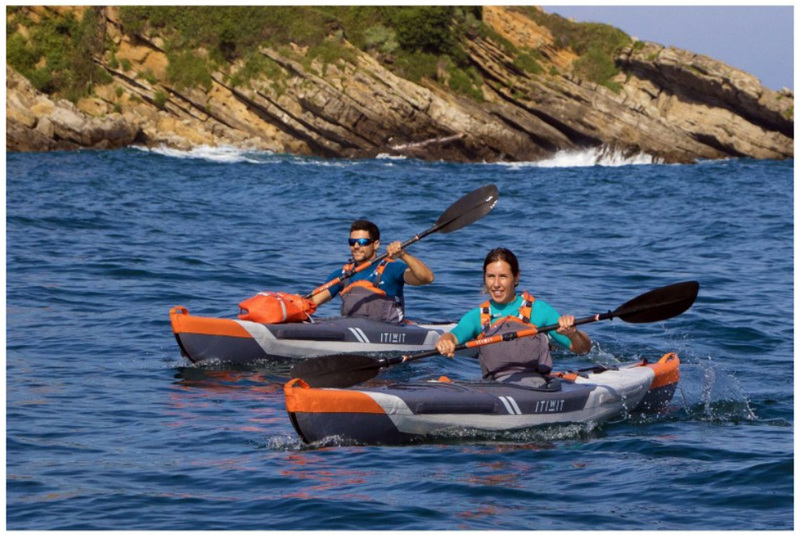 First Gumotex and now Europe-wide, French sports retail giant Decathlon have turned to drop-stich (D/S) technology in a bid to improve rigidity and so, performance of their inflatable kayaks. Only Decathlon have not just added a D/S floor to an existing model, but with the single-seater X500 have designed an entire 10psi (0.7 bar) D/S hull complete with a deck sheet and coamed hatch supported by two D/S beams. (Do you need a deck?) Above left, Serge and Nanook take their X-boats for a spin. 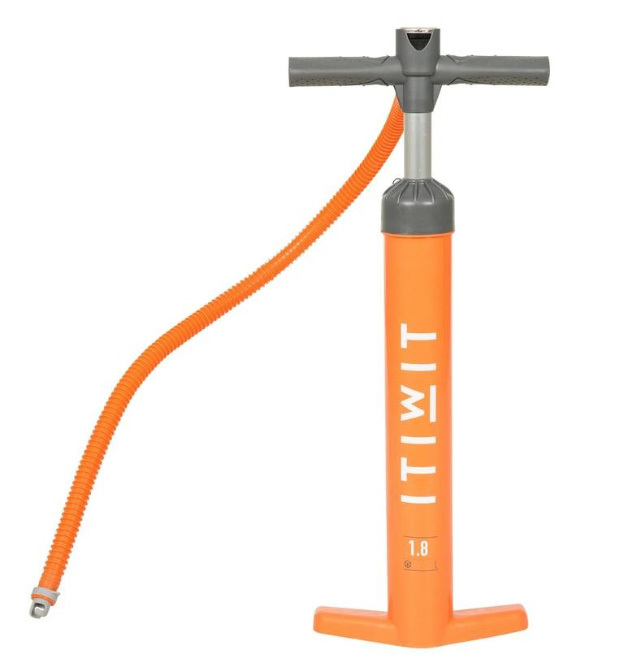 UK price is a very reasonable £560 delivered with a two-year guarantee, although the two-way pump is another 25 quid. 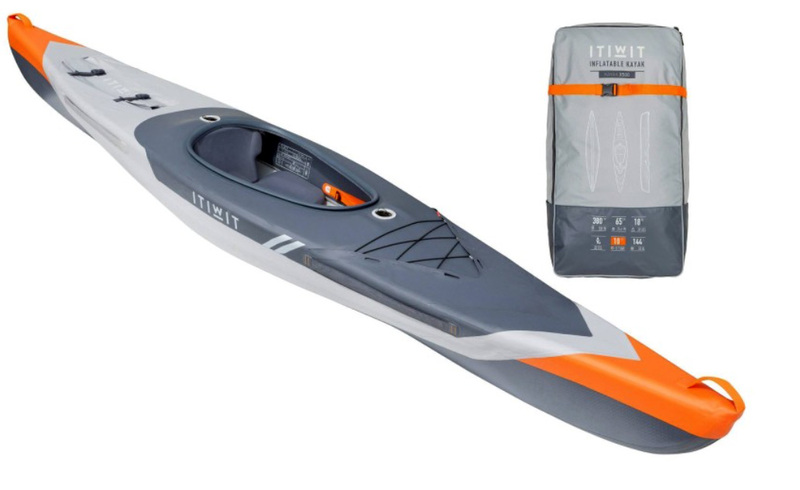 ‘Itiwit‘ is a Decathlon water-sports brandword, contracted from ‘itinerary’ and ‘Inuit’, the fur-clad denizens of the Arctic who invented sea kayaking all those centuries ago. Watch the slick vid below to get your head round the unusual design. It looks like the dark grey V-floor panel is one chamber, plus a lighter grey sidewall panel each side and then the two deck-supporting thwarts or beams. And being French-designed, it conforms with their national regs which allow it to stray a full 300 metres or more from the sea shore. Vital stats are 3.8m long by 64cm wide and 16kg making it similar to an undecked Kxone Slider 375 and between a Gumotex Twist 2 and a decked Framura or Swing II. And it’s not made of PVC like Sea Eagles and the like, but polyethylene (PE) over a polyester (PES) fabric core. Though I’m not sure that makes a massive difference to longevity or cold-weather ease of folding. Like most other D/S IKs, you can be sure it’s made in Korea or China. Because D/S hulls have less air volume than regular IKs they’re slimmer (thinner walled; more inner volume) and are quicker to pump up (3 mins, claimed on the X500). But that lower volume may explain a modest payload of just 125kg. No dims are given on the hatch size but based on the length, I’d guess it’s 80cm long. Below, watch Nanook film Serge as he effortlessly assembles, paddles and then disassembles his X500 in what may be real time. The roll-top rear hatch is a clever idea; not seen that before though it looks like water may pool there. 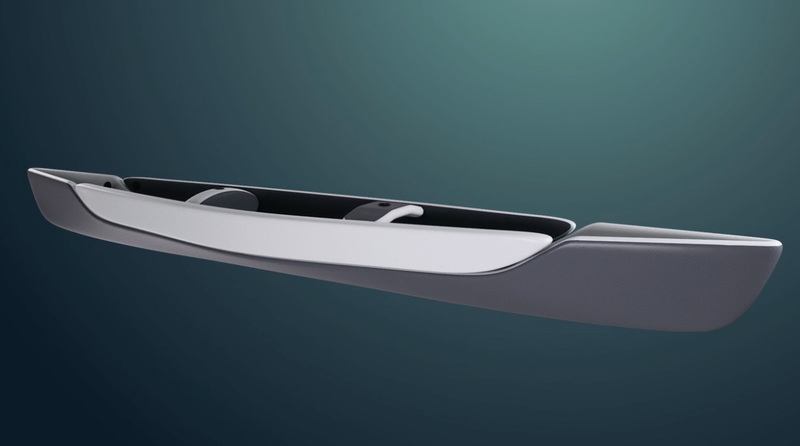 And the proper wave-slicing V-hull dispenses with the need for a skeg, but the boat may benefit from a rudder in cross winds, as like most IKs, the X500 sits fairly high in the water, unlike a proper hardshell sea kayak. 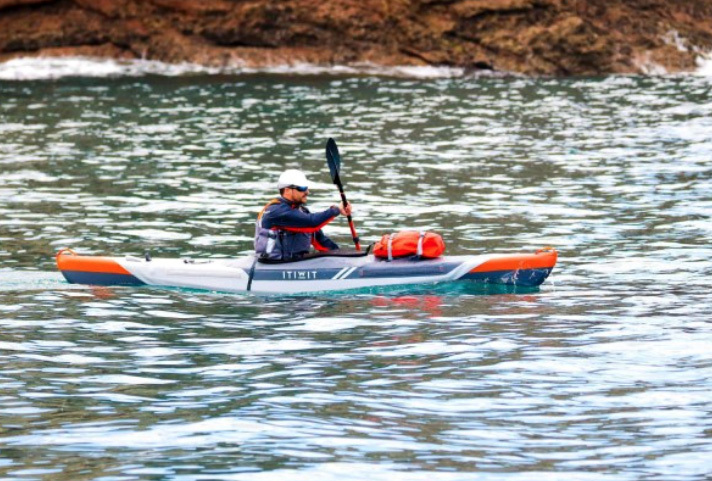 And below is a real-world review by a sea kayaking chap on what looks like the balmy Med. I agree with his suggestion: would be good to see a longer version, but that will probably be a tandem which, with a fixed deck, won’t adapt to solo long-range touring. The X500 has strap–adjustable footrests but he mentions poor knee bracing – another IK weak spot, even with decked boats. Nevertheless he still manages to bang out a pretty smooth eskimo roll, and it would not be impossible to glue or somehow clip on some thigh bracing straps which greatly improve connection and control of the boat. 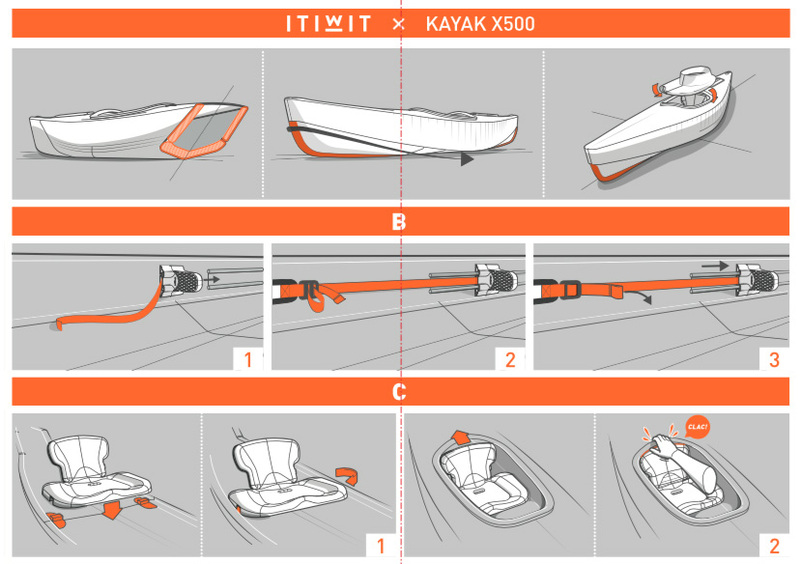 This entry was posted in Inflatable Kayaks and tagged Decathlon X500, drop stitch kayak, Itiwit. Bookmark the permalink.